This is one of those pieces of equipment that most bicycle tourist probably skip over and decide the extra weight is just not worth it. So let me tell you about how wonderful it was, having our Hilleberg UL 10 tarp. 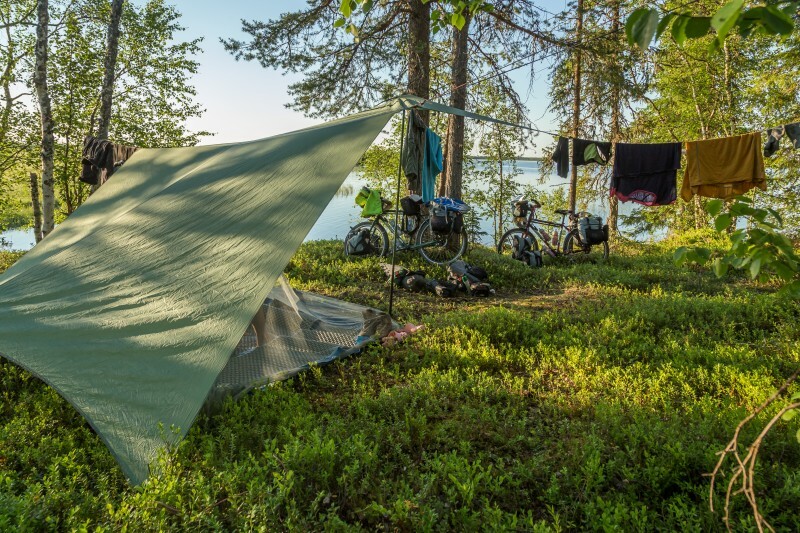 We actually purchased our Hilleberg UL 10 tarp several months before setting off on our around the world bicycle touring adventure and used it several times for short overnight bike trips here near our house. Hilleberg makes 3 other tarps, but we are only going to write about the UL 10. 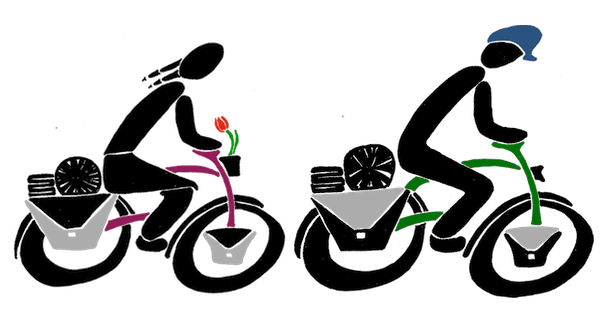 The UL 10 model is their ultralight (UL) version and it approximately covers a 100 foot square area. It does have a longer side and a shorter side and you will discover there are benefits to this if you use it enough, we did. Very quick shelter when you are in the middle of nowhere and a storm suddenly approaches. Offers some privacy when you are camping in busy campground. Can be used as a awning along with your tent for those extended campground stays. When it is very hot out, you can just set up the tarp along with a mosquito net and sleep under the stars. Helps protect your expensive tent from the elements like the sun, snow, hail, falling tree limbs. It is a great wind breaker for those very windy days. Great shelter for those nights when you have to be extra stealthy when free camping and you do not want to set up a tent. These are just some of the benefits of having the UL 10 tarp and I am pretty sure there are many more. They are not cheap and will set you back about $190US; however, this tarp is quality made and does not come from a sweat shop in China. Furthermore, Hilleberg’s customer service is top notch and they will not abandon you, should you have any issues with their gear. We promise! You will have to purchase the stakes separately. We went with Hilleberg’s “Y” peg and they worked great for us in nearly every weather and environment condition we encountered. If you want the Hilleberg’s tarp pole, you will have to purchase this separately, too. We highly recommend having the pole because there will be times when there is nothing around to raise up at least one side. The pole is super strong and can take a beating in the worst of conditions. The pole collapsed is only 20.7″ (52.5cm) and can be extended in 2.8″ (7cm) increments from 73.2″ (186 cm) to 84.3″ 214 cm. Fabric: Kerlon 1200 (more about the fabric here). 8 adjustable guide lines are attached. Packs away nicely in an attached stuff sack on the tarp. Wild camping under the tarp on the British Canals. If you decide this is something for you, then please continue reading. We always encourage shopping and supporting your local Mom & Pop stores first. 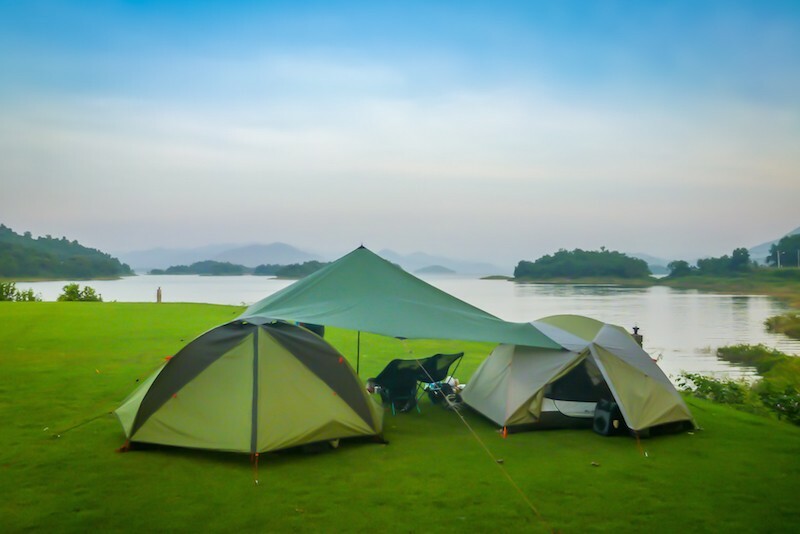 However, I doubt you will find this at your local outdoor shop, so you can either order directly from Hilleberg or if you are keen on shopping through Amazon, please use the link provided below or the one located in the footer section of our blog’s homepage. We get a small kickback and all proceeds go towards maintaining this site. If you do order directly from Hilleberg please let them know you heard about them from us. We do not get any kick backs or any special favors from Hilleberg, but they took really good care of us before and during our trip and we would like for them to know we care and support them. Again thank you for your support and happy travels. this place looks very relaxing. Yeah it was very relaxing there. Sadly we were unable to cycle deeper into the jungle because of a bicycle and scooter ban. We honestly think the park rangers were just trying to make some cash off us because they would drive us in and back out for the day, but they were asking a pretty high price for that. Really enjoy the gear related reviews. Have been iso a tarp of similar size. Often wondered if two can sit under this size tarp when pitched with a partial roof? We used our tarp nearly every time we pitched our tent and never had an issue fitting both of us and sometimes our bikes under it. Truly love and highly recommend a tarp for traveling. We even slept under it without our tent on several nights when we were being extra stealthy. The Hilleberg UL10 tarp has 8 ropes attached and the stuff bag is attached in one corner. You will have to order stakes and a pole if you want one. The pole is not used in the middle of the tarp. However, it can be positioned at any of the same points where the rope is because there is a little metal ring at each location for the tip of the pole to slide through (hope this makes sense). We did have one issue of the tarp beginning to leak along the seam where the two halves are sewn together after many months on the road. However when we contacted Hilleberg to ask them what they recommended to use, they 3 day shipped us some Sil-Net from the US to our location in Germany. We never asked them for this and it was a great surprise. Their customer service is top-notch.